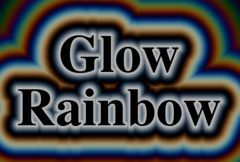 Generates rainbow colored glows based on the distances from the edges of the source input. Any edges in the input image, where the brightness crosses the given threshold value, will generate an equal glow into the darker side of the edges. This is best observed when used on images with dark backgrounds. Glow Width: Default: 0.42, Range: 0 or greater.